With the concept of PlugIns you can easily expand the functionality of ACom. You can see the PlugIns by tapping the drawertoggle. 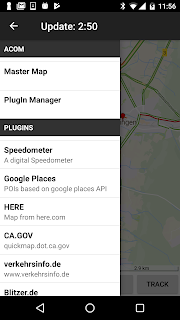 "Master Map" and the "PlugIn Manager" are pre-installed modules, which can't be deleted. The MasterMap represents the core application of ACom. With the PlugIn-Manager, you can install or delete PlugIns. You can develop your own PlugIns. The development is described in detail here.